RIELS Instruments for over 40 years has been supplying industrial automation products and services backed by specific skills concerning Flow, Pressure, Level, Temperature and Humidity controllers and Flow meters. RIELS Instruments is a sole supplier, capable of meeting all requirements with regard to the control and monitoring of pressure, temperature, level and flow variables in all industrial fields such as: petrochemical, chemical and pharmaceutical, food processing, shipping and water conditioning. The team, skills and quality. Riels Instruments is a dynamic enterprise backed by the experience of a team of experts who have been working on this market for many years, offering customized solutions, which are developed especially to meet specific application requirements. Riels Instruments offers its customers global consultancy and assistance throughout the national territory, availing of a team of technical experts who are able to advise the best possible solutions. Fundamental requisites such as reliability, precision and qualified assistance are the distinguishing features of RIELS Instruments. Our enterprise is chosen and appreciated by major national and international companies and manufacturers. On 7 February 2011 RIELS INSTRUMENTS achieved the important objective of certification of the company's Quality System in compliance with the international UNI EN ISO 9001:2008 Standard. 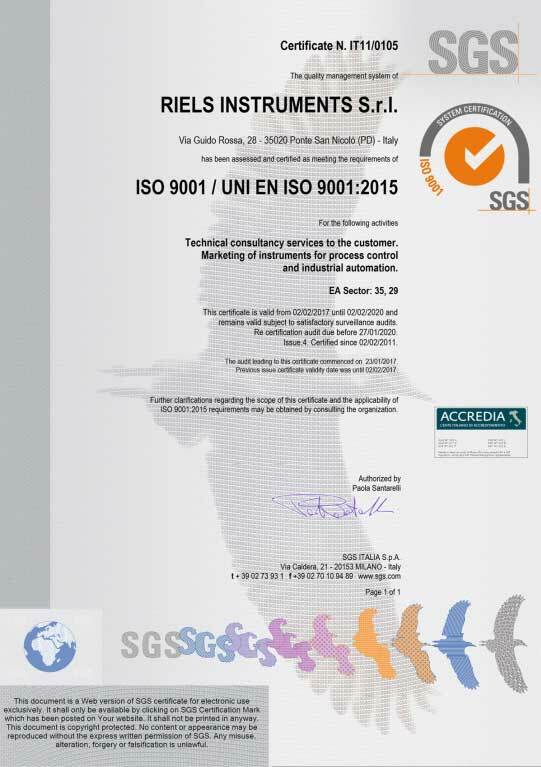 Certification was issued by SGS Italia S.p.a. The certified activities include the marketing of instruments for process control and industrial automation. The purpose of the certification is to develop, carry out and improve the efficiency of the quality management system, so as to increase the satisfaction of our Customers.